This a feel good story about an orphaned girl that lost her parents tragically, and was separated from her siblings. She settles in Boston and starts college, determined to get the best job, that pays the most money, so she will be able to find her family. While taking classes, Hope works for an answering service. She gets to know all her "clients" and they are all fond of her. Then she starts taking messages for Zach Givens. A driven, arrogant, spoiled, very rich man. Hope believes the butler, Griswold is the person retrieving the messages because he is so nice. But, Zach is the one she is really talking to. The two of them start having little chats over the phone. Then when "Griswold" comes down with a cold, Hope stops by mansion to deliver some homemade soup. The two of them start to fall in love with each other. But, Zach still holds off telling Hope who he really is, believing that once she falls in love with him, she will forgive him. ????? 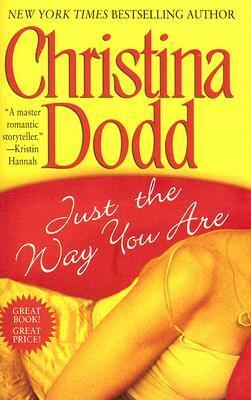 I originally thought this book was a romantic suspense novel, since it wasn't one Christina Dodd's historical romances, or paranormal romances. But, this is really a contemporary romance, almost chick lit. I think it would be fair to say it was like a Cinderella story. Hope barely gets enough to eat, her clothes are worn thin, she lives in a bad neighborhood. But, she has grit and determination and values. Zach, having power and privilege is used to getting anything and everything he wants. But, he never bargained for Hope. This is pure entertainment. A sweet, funny, feel good romance with an uplifting Happy Ever After! Sign into Goodreads to see if any of your friends have read Just the Way You Are.